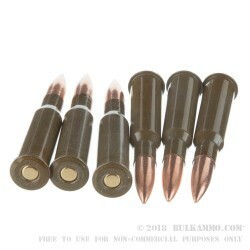 This is a 500 round case lot of 7.62x54r ammunition for your Dragunov/clones and your Nagants. This is a great ammunition choice for those who want to save a bit of money but need high reliability and excellent accuracy for their dollars spent. This is made after the same specification of the military surplus rounds that have been on the market for 30+ years in the United States in large quantities. As that stuff has dried up, this has been coming online to replace it – with non-corrosive components. Just that alone justifies the price. The ammunition shoots a bit dirty but it is very inexpensive and offers great accuracy for the money spent. The Brown Bear line is a well-known offering and has many fans of the generally high reliability ammunition. It’s called the “Brown Bear” because of the characteristic Brown lacquer that covers the outside of the cartridge casing. The underlying casing is steel, so the lacquer helps with feeding and extraction in most guns. This is a step up from the typical 1950’s and 1960’s surplus that you can find on the market today. The performance is very nice, but the round is not reloadable, thanks to the Berdan primer and the steel case. Q: Is this ammo antimagnetic?I am holding up an order of 30.06 until I get an answer to this question.If this ammo won`t attract a magnet I will combine the orders. A: Hello Chuck! This specific ammunition is loaded with a bi-metal jacketed projectile. As a result, the ammunition does contain steel and will not pass any type of magnet test. Q: I've shot some mil surplus 7.62x54R in my Mosin, (not your product) and it leaves the messiest residue of any ammo I've ever fired. I've used Hoppes #9, PB Blaster (sparingly), Strike Hold, and Break Free... it STILL has some cruddy residue. Any suggestions? Does this Brown Bear do the same? BTW; thanks for being a TSP Sponsor! A: This Brown Bear ammo is non-corrosive and will not leave deposits of salt in the bore that can attract moisture and promote corrosion like military surplus ammo. Q: I recently purchased a Mosin Nagant rifle and have never heard of a "rimmed" cartridge prior to my purchase. My question(s) is/are: What was the reasoning for the rimmed cartridge? Did all rifles from this era in similar caliber take the rimmed cartridge and why do we not see modern rifles using rimmed cartridges? Thank you for your time and thank you for supporting the TSP!! A: Rimmed cartridges were produced when that was the easiest way to headspace a cartridge, or make sure that it was in the proper location prior to firing. The rim would stop the cartridge from going any farther into the barrel. More modern cartridges headspace off the case mouth or shoulder, which require more complicated manufacturing methods. Rimmed cartridges present special feeding issues in box magazines that are sometimes not easily overcome, which is why there are not many new firearms for rimmed cartridges and very few, if any, new rimmed cartridges currently. Q: Is this ammo considered "current production" or is it repackaged old surplus? A: This is new production ammunition. A: Unlike some surplus ammunition, this Brown Bear ammunition is non-corrosive. No special cleaning procedures are required. Q: I have had problems in the past of "painted" brass fired from my Mosin Nagant expanding more than standard brass after firing and causing "Sticky Bolt Syndrome". This appears to be painted as well, have you had any problems with this brand causing this over expansion? A: This Brown Bear ammunition is loaded with lacquered steel cases, not brass. I have not had the issue you describe with Brown Bear in my Mosin Nagant. Q: I notice many of these russian rounds come in Steel casings. Why is that? Is there any advantage/disadvantage to shooting steel over brass other than cost? A: In the 1920s, Russian ammo production shifted from brass to steel to preserve resources. Since that time, the Russians have become experts at manufacturing steel cases. The primary benefit to most shooters is the lower cost per round. Q: Is this a reload-able round? I know alot of mosin nagant ammo is NOT reload-able. 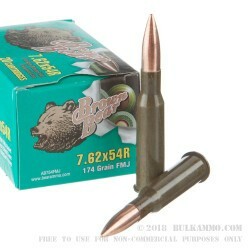 A: This Brown Bear ammo cannot be reloaded. Q: Is this ammo corrosive and is it newly manufactured or from stockpiles? A: This Brown Bear ammunition is noncorrosive. It is newly manufactured in Russia, and is not from any military stockpile. It is not surplus ammunition. Q: I currently own 7.62x39 firing weapons, but I am curious in the larger round of the 7.62x54r. What does the (r) stand for? What are the most common type of weapons that this round is for? Is this round common? Thanks. A: The R stands for Rimmed, because this cartridge has a prominent rim at the base that protrudes from the walls of the case. The most common weapons in this caliber are the Mosin Nagant, Dragunov, PSL, and PK/PKM. Because millions of weapons have been chambered in 7.62x54R, it is considered a fairly common round worldwide. A: The only true way to tell if unknown ammo is corrosive is to fire it and let the gun sit, then wait for it to either corrode or not. This ammo is known to be non-corrosive, so there are no such concerns. When using suspect ammo, thoroughly clean all internal parts including the bore with soap and water, in addition to traditional cleaning oils and solvents. Q: A lot of ammo at gun shows for the 7.62x54R always seem to be very corrosive. Are these? 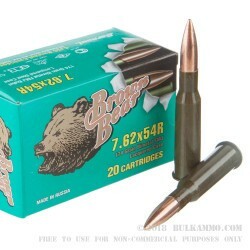 A: No, these Brown Bear 7.62x54R cartridges are not corrosive. Q: Can the casings be used for reloading? Q: What is the ballistic coefecient? how do these compare to .308 in terms of trajectory, max effective range and penetration? A: The G1 ballistic coefficient of this 174gr 7.62x54R projectile is approximately .46. This ammo compares favorably to .308 in terms of max effective range and penetration. Q: Whats the proper way to store this ammo long term? A: Store this ammo in a cool, dry place, away from sources of moisture and heat. 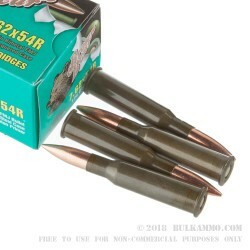 Q: I hear a lot about different kinds of 7.62x54r being corrosive. Is this a corrosive or non-corrosive round, and do I need to take any special measures after shooting these to protect the inside of my rifle's barrell? A: No, because this Brown Bear ammunition is new production, it is not corrosive ammunition. Surplus military ammunition on the market may be corrosive, but cleaning up after it is fairly simple, with soap and water being highly effective. However, to reiterate, this is not corrosive ammunition, and no special precautions or cleaning regimens are required.